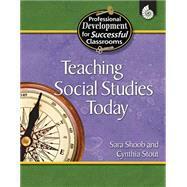 Featuring sound educational strategies based on solid research and proven methodology, this exceptional resource provides teachers with best practices in social studies instruction that can be immediately implemented in the classroom. Authored by two social studies experts with more than 60 years combined classroom experience, this resource is designed for anyone who is interested in current educational theory and best practice. Packed with various teaching methods and techniques, up-to-date research-based theory and practical applications, this book is great for new and experienced teachers.200 pp.